The murmur of writers was regular background noise when I was growing up. There were books in every room. I always smiled politely at the poets in my living room sharing new work with one another, knowing to be quiet on the evenings when they were there. I knew it was kind of special, although thought it not particularly unique, to receive poems from my mother on special occasions, and to see her work in the poetry anthologies on our shelves. I also thought it was totally normal to be taken to the theatre all the time. I wasn’t fully aware back then that this early artistic education was a huge privilege, and a gift that would have such a profound influence on my career. 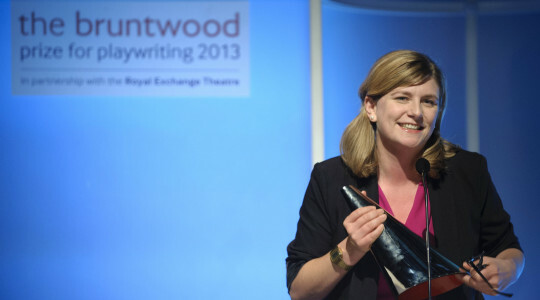 Given my background, it is no surprise that I have ended up working in theatre, and particularly with writers. It is, however, perhaps a little bit more of a surprise that the first ACE funded, full-length run of a production I’m directing just happens to be a play written by my own Mother. Looking back at early drafts of ‘The Noises’, Mum – Jacqueline Saphra – and I were reminded that its first iteration arrived in early 2015. It took the form of a monologue she wrote for a competition on a bit of a whim. Having not written a play since the raising of four children borrowed most of her time, she wanted to see if writing for theatre was territory she was still interested in exploring. She missed the monologue competition deadline, but the character stuck around. I must have read a draft a few months later. Mum reminds me that one of the first things I asked her was why, if as a poet she did so many beautiful things on the page with the shape of the poem, in this theatrical monologue she’d just written it as a simple block of text. The play started to expand and change shape. I offered my thoughts on it in a casual way. Mum was experimenting with a non-human voice, and I was teaching myself how to be a dramaturg – how to best to serve a new play and offer constructive feedback. 2015 was the first year I read for the Bruntwood Prize. I know now that the best possible way to understand how a play works is to read as many as you possibly can. Hundreds, preferably, and in quick succession, immersing yourself in the form and working out what works and what doesn’t, then pushing yourself to figure out why. Doing this, I began to develop an ability to sort of feel a play. Sounds a bit romantic and esoteric, but the way my brain now works is definitely through trusting my very immediate gut response. It’s usually to do with rhythm and sound, I think – if I can hear it, it gets my attention. This trust in myself took me a while to hone though. I remember the constant doubt I had about my own opinions to begin with, not feeling I had the right to know, or indeed to tell anyone what a play could be. Plays still regularly crop up which send me back into a flurry of doubt, of course. When the ‘The Noises’ was transforming from a monologue into a play, I didn’t really know what it was. It had rhythm, poetry of course, and a clear focus. As a dramaturg I could see what it needed, but I wasn’t yet able to really hear it. Between 2016 – 2017 I was directing lots of shorts, and assistant directing a fair amount, but I hadn’t yet found a play I wanted to spend more of my time on. During a period of frustration – where were the plays I wanted to make? – over a chat about the next draft of ‘The Noises’ Mum gently said – ‘If you’d like to, this play is yours to direct.’ I hesitated. I was a bit frightened of it. I wanted to direct a play with multiple characters in it, not only one. Also – this was my Mum. We’d collaborated before, but only on poetry-based performance pieces, and a few larger scale events. I think I was a little nervous of the connotations of working with a family member, as well as the challenges it might pose to our relationship. The conversation paused there. I can’t remember whether Mum told me she was submitting the play to The Bruntwood 2017 Prize. Either way, both of us must have mostly forgotten about it, as you do when you enter a competition with thousands of entries. I was a reader that year for Phase Two, and of course I didn’t come across it. We were on a long car journey back from somewhere together and I saw on twitter that the Longlist had just been announced. I was scrolling through to see if any of the plays I’d read had been longlisted: found one, found another, and was thrilled to see two brilliant new plays taken further. Then, I scrolled down a bit more and saw ‘The Noises’. I don’t think either of us believed it was Mum’s ‘The Noises’, until we saw the ridiculous pseudonym she’d chosen next to it – ‘B.R. Mutt’ (the play, by the way, is told entirely from the point of view of a dog). Out of thousands of entries, this crazy, special play had made it into the final 100. Another director and Bruntwood reader, Andy Routledge, got in touch with Mum because he liked the play and had some thoughts he wanted to share. She cites some of his suggestions – particularly those to do with the re-ordering of the narrative – as instrumental in getting the work to its post-Bruntwood next draft. Late 2017: me, as training dramaturg offering thoughts both huge and teeny tiny; Mum trudging courageously on through five drafts, seven, ten. I think maybe there’d be as many as 20 drafts by the end of 2017 – that’s the good thing about working with poets, they’ll refine and refine and refine and the work is always moving. No matter how practiced you become, when you are that close to a play for so long, there comes a point where you lose the capacity to see it properly. After two years working on this one, I had reached that point. As a way of helping with this ‘reader’s block’, I often try and more actively read the work from another perspective. I imagine I’m a designer, or an actor, for example. I dared myself to start to think of ‘The Noises’ from a director’s point of view, and my perception shifted. My own directing work had become slightly more experimental. I love a neat Aristotelian dramatic structure as much as any theatre nerd, but I’d been giving myself permission to work with writers who challenged theatrical form and pushed at its boundaries. Within this context, ‘The Noises’ started to become less scary, and more exciting. I don’t think it’s worth directing a play unless it wants to change the world a tiny bit. I know the work I make has to offer a fresh perspective, interrogate a subject from a new angle, and above all to recognise its own responsbility and power as a piece of live performance. I suddenly realised (duh) I’d been helping to shape the play I wanted to make, so one evening I said – ‘Alright, let’s do it’. Soon after, we found a home for ‘The Noises’ at the Old Red Lion, and it started on its journey towards production. ‘The Noises’ is a play-poem hybrid. It’s told from the perspective of a female character – a dog named Luna – bruised from a history of violence, desperately in search of love, listening to a world in catastrophe and searching for the courage to take action. It borrows the openness of metaphor from poetry, its emphasis on rhythm and sound and its physical shape on the page. Being part-poem also somewhat liberates the play from some of the constraints or expectations of theatre dialogue. The central voice treats spoken language like it is hers and hers alone: as if she has created it only because she has to tell this particular story, to this particular audience, at this particular moment. Mum often jokes that she ‘bred herself her own personal director/dramaturg’, and I suppose she kind of did, although it’s worth noting that I have three other siblings who don’t work in the theatre. We were all taken to the theatre as children, all plied with poems and plays and novels, and I really was the only one who latched on. Without the Bruntwood, this production may never have happened. Not only did being longlisted give Mum and I faith in the play itself, but looking further back, the competition offered me my first foray into script reading. It gave me the confidence to offer my response to ‘The Noises’, and to know that my thoughts had value. The Bruntwood was the first organisation post-University to tell me my opinion about plays mattered. It was a vital stepping-stone, which led me into reading for the Papantago prize, the Bush, and most recently for the National Theatre and the Almeida. I’m excited to be a Longlist reader for this year’s Bruntwood prize, reading plays that have passed through the hands of an immense team of brilliant readers, through four long stages of reading – the work of 100 playwrights who have daringly and lovingly crafted their 100 plays, remaining anonymous with their 100 brilliant pseudonyms. Hopefully within that 100, some of the playwrights (and perhaps, the dramaturgs who may have worked with them) will feel the same moment of elation as my Mum Jacqui and I, when we spotted ‘The Noises’ on that Longlist. Tamar is a director and a dramaturg and works closely with playwrights to develop new plays. She trained at Mountview Academy of Theatre Arts, and is a Resident Director at the Almeida Theatre. Tamar regularly experiments across artistic form, collaborating with artists, composers and writers. 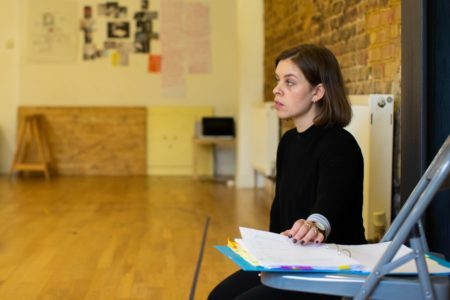 She is currently a script reader at the National Theatre, the Almeida and for the Bruntwood Prize, and has previously been a reader for the Papatango Prize and the Bush Theatre. Tamar is co-founder of Rough-Hewn (www.roughhewn.org), a script reading service offering dramaturgical support to playwrights. As director, credits include: THE NOISES (Old Red Lion, April 2019) AFTER VIOLENCE (Sutton House/Dulwich Picture Gallery), WHAT HAPPENED TO YOU? (Bunker, R&D), NO. 152 (Arcola), PIG WATCH (Arcola); HASTE YE BACK (Arcola). As assistant director, credits include: EWELINA’S CRYING (by Anna Karasinska, Yard Theatre), MIDNIGHT MOVIE (by Eve Leigh, dir. Rachel Bagshaw, Bush), AUGMENTED (by Sophie Woolley, dir. Rachel Bagshaw, Ovalhouse).